With time a lot has changed in the world of web designing, development and optimization and novel techniques have taken the place of old and traditional techniques. In the world of SEO, a lot has changed as well with new algorithms published by the major Internet Search Engines. 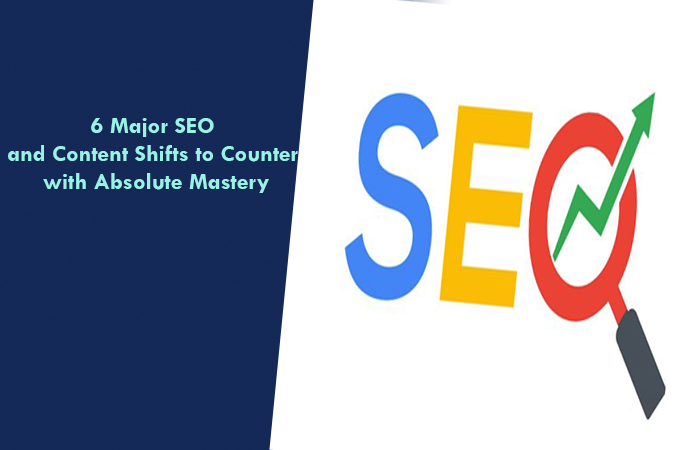 Most of the change has occurred due to the new algorithm published by Google which has introduced new techniques of Search Engine Optimization for ranking the websites on Google. The major shifts in the algorithms, as well as the dawn of mobile technology, has brought about the revolutionary change in the SEO strategies as well, at which we will have a keen look below. Given under is a list of 5 SEO shifts the web’s designers and optimizers should be familiar with in order to keep pace with the trend and the most out of the internet platform by making profits. SEO is Not Enough Today! It must be stressed that SEO alone isn’t enough to make sure that everyone will be able to find your content online and will find it more useful as compared to other content of similar nature on the internet. What you also need to keep in mind is to add more data to the content creation on your site as a marketing and publishing your content on the internet without putting enough data in it will be of no worth. You need to Foster search, social and content synergy in order to get on the right side of the new Google algorithm. Creating SEO-friendly content through various SEO techniques is the top priority of all the web designers. What you need to do is to maximize your search engine results page (SERP) footprint which will greatly help in the higher ranking of the website in Google search results. You have to create articles, videos, and infographics which can be circulated on the internet as high-ROI content. You can publish viral and trendy topics on your site in order to get cheap marketing help. A responsive website is one which is specially designed to adjust and adapt to the nature of different operating systems and provide the users of Desktop and Mobile, equally integrating user experience. You have to give special thought to making your website mobile friendly as the mobile platform is huge in the age and time. You have to research on what your audience is and how you can target it through Google Hyper-local search options and by making the use of the novel techniques. Hyperlocal search is of extreme importance and it is the need of the niche websites as well. You have to integrate the voice search functionality in your website as the world is fast moving towards it. The voice search results on Google can be different so a serious research into the keyword requirements needs to be done in this regards as well.